I hope he not ded. I really like that guy. Did we establish he was real? I thought he was a projection Patrick made in people’s minds? We see Patrick chatting with him when they’re alone together at one point, seems like he’s an actor Patrick hired to look respectable in negotiations. Can someone explain the pronouns to me, please? Is the “he” we’re referring to here the old guy in the last three pages, and do all the “he”s in this thread (“he ded”, “he not ded”, “he was real”, “he’s an actor”) refer just to him? I’m a little confused by the projection in people’s minds bit. Yes that is the “he” in question. The projection in people’s mind thing was based on the fact that we’ve seen this guy negotiate with people as the face of Patrick’s organization, so Meghan thought he might not even exist and was just a projection Patrick was making people see. But as I said above that doesn’t seem to be the case. I doubt he’s someone Patrick hired. I suspect he’s like Cleaver, someone Patrick was sympathetic to in a way nobody else could be, and thus he (Patrick) earned his (Duval’s) loyalty. It seems unlikely a hireling would be sufficiently loyal for this job, after all, and Menace’s organization apparently had a lot of people who Patrick valued. Edit to add slight explanation to make who I’m referring to clearer. Oh no, Patrick was too messed up to order this guy not to do anything important without him wasn’t he? Either that, or Duval’s insecurity about how all the great “achievements” in his life weren’t actually his own pushed him to act without thinking. Or he wrongly assumed that it wouldn’t be anything he’d need Patrick for. I genuinely hope this won’t be the narrative we’ll follow, or a mere red herring. I always hoped these two had developed some sort of bond over the years of being the only ones in the know. (Patrick needs friends) Hell, I’d take it even one-sided, if only it’s Mr. Duval who’s become endeared to Patrick and won’t ever betray him. Or he’s just trying to keep the empire ticking over until the boss is back in the, and just isn’t as good at it. I doubt he’s missing it. Yep. My thought too. We’ve already established that his connection is strongest with those who feels closest to. It would make sense for him to work at developing an incredibly strong bond with his proxy so that he could almost always be aware of him. The reason the Conspiracy has been so elusive all this time? The Storm™ affected them in different, more insidious ways. They’re not normal people anymore. 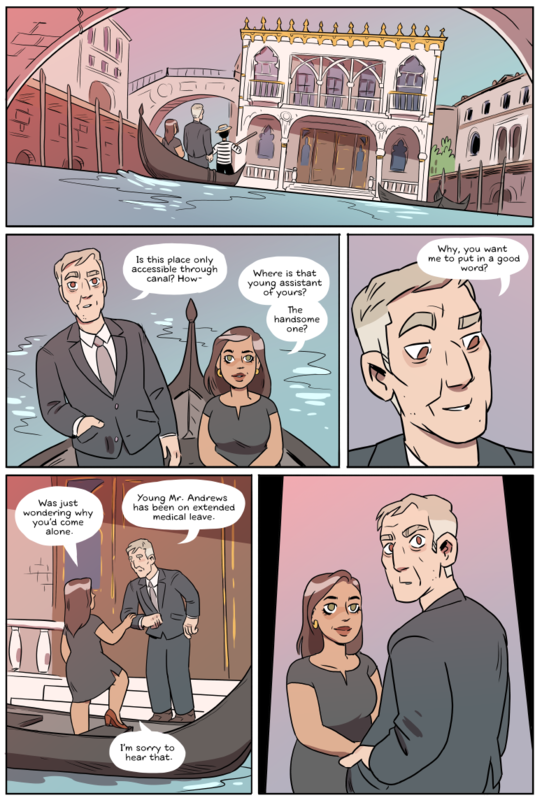 They all became… [roaring suspense thunder] gondoliers! With fares so expensive, they roam unchallenged over the waters! Unbeknown to humanity, they conquered 71% of Earth’s surface right under our noses. This is genius. Ask yourself this: who would benefit most from an aquatic entrance? What canary creature could create such dread in the old white-head-feathered human? Search your heart, you know it to be true. That face in the final panel is giving me flashbacks to dramatic hamster! Okay, I just lost a little bit of respect for Mr. Duvall. There is clearly a bridge leading to the house, and yet he asks if the house is only accessible through canal. I need a drone shot from overhead – maybe there’s a complex of buildings that is only accessible by canal or something. From what I know of Venice, this is also like, not extremely uncommon? At least a few buildings I know don’t have a back entrance. Don’t tell him about islands though, his heart may give up. I think the bridge is behind the house. This is right. The house is directly in the middle of the canal, and then the canal bears left after the house. The bridge we can see is a bit in the distance. I have a new monster for my D&D campaign! I’m not sure, but “only accessible through canal” sounds strange to me. I’d think it would be “only accessible though a/the canal” or “only accessible BY canal”. I don’t normally comment but the vibes I’ve been getting have kinda pushed me to. So a couple pages ago, Tony asks, “How old? Habsburg? Romanov? Some long lost de Medici?” And that struck me as interesting but not something I followed up with at the time but the next page he mentions kissing someone’s ring… and the page after that “the society” was mentioned. Looking into the names mentioned, they all seem to be old houses with significant political power. I think that not only is this the Conspiracy, ran by some sort of shadow royalty for decades… I think they are going after Tony now because Patrick was always around and they had some knowledge of his abilities and this was the opportunity to get to someone close to Patrick without Patrick being aware of it. Which will mean bad things for Tony very soon. Though why wouldn’t they just take out Patrick? Do his powers really give him enough situational awareness that they couldn’t get him with a sniper or something? I mean, I don’t think they want him dead. Dead is easy. They are a shadow society, they want control and influence. Patrick is really good at that, so they want to have control of someone close to him or at least, they want a way to take a closer look at him. Yeah I guess we will have to see what their deal is. To me Patrick seems way too dangerous as an enemy to even consider letting him live, especially since nobody would be upset if he just vanished one day. Well, if they know that Patrick is the true power behind Templar, killing him might create a power vaccum that becomes troublesome. Patrick is already of the opinion that the society didn’t kill him because they have assessed him as a non-threat. But that was just about not eliminating him as a child in the purge of people with too-dangerous powers right? It seems like they should prefer almost anybody coming to power who’s no Patrick since he’s the only one dedicated to destroying them. The decision to purge may not have happened until after Patrick escaped. And Patrick escaping, with the obvious danger he could poses on his own, could easily have influenced the ultimate decision to clear out the more problematic cases. Patrick is supposed to not be on the Conspiracy’s radar because he’s not dangerous enough to change the world. I don’t think they suddenly changed their mind on the matter. I thought it was that the Conspiracy was aware of Patrick but didn’t consider him a threat. They may still not see him as a threat but worth consideration as a possible ally or potential threat. Remember that while everyone with abilities that was killed by the Conspiracy had powers that could have changed how the world functioned, that was their power when they first learned how to use them. Patrick’s ability to read minds may not be threatening but his ability to impose his will on someone else’s mind could definitely be worth reconsidering their opinion of him. The Gondolier is bring the boat in backwards. Curious. Can anyone point me to any of the previous strips this Tony guy was in? I don’t remember him at all. Here you go. Only a few pages, but definitely him. I suspect Patrick is piggybacking on Tony’s conciousness. The danger is if the Conspiracy has espers able to detect his “remote viewing” presence – perhaps even trap him out of his body?